The weekly mailbag discusses Felix Hernandez, as always, choosing to keep Guillermo Heredia over Ben Gamel, the struggles of Kyle Seager, FanFest in 2019, journalism, television, country music and fly fishing. Going back and looking at the performance of recent Twitter mailbags, there has been some regression to the mean. The question/answer differential that was once promising was ultimately unsustainable given the space in the paper, the time of the answerer and the pop culture references left unused. September 16 | All things Nelson Cruz, including a possible future in ... Houston? September 9 | Buyer's remorse on Dipoto and Servais? Will Ichiro play in Japan? September 2 | Why didn't M's go all-in before August waiver deadline? The on-Twitter percentage is high still, but many solid questions are being stranded in the timeline. That’s not winning Twitter. But with a new Control The Tweet approach, that differential should improve. As always these are really questions from my eclectic mix of Twitter followers. 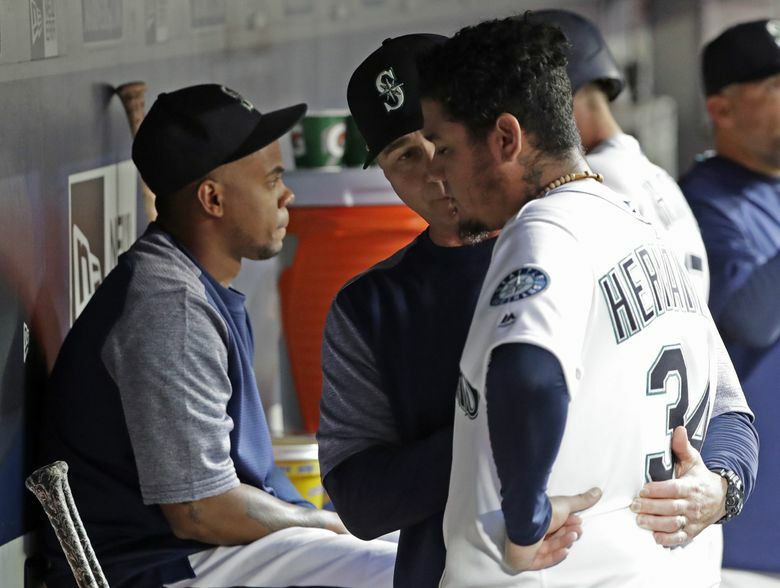 To be honest, manager Scott Servais doesn’t single out Felix Hernandez over his poor performances. It may feel that way because Hernandez has had more poor performances than quality outings this season. Of his 22 starts in 2018, Hernandez has pitched six complete innings or more in just eight of them. And of those 22 starts, he’s only allowed two runs or less in seven of them. If you think about it, Servais has never really seen Hernandez pitch at a consistently high level since becoming Seattle’s manager in 2016. That first year in 2016, Hernandez posted an 11-8 record with a 3.82 ERA. Those are respectable numbers for most pitchers, but Hernandez missed six weeks with a calf strain and also the signs of his command issues and hitter’s adjusting to those issues were glaring toward the end of the season. He posted a 6.06 ERA in his final seven starts of the season. In 2017, Hernandez made just 16 starts, going 6-5 with a 4.36 ERA, making two separate trips to the disabled list with a strained shoulder. Servais has never really seen the greatness of Hernandez up close. There have only been hints and glimpses of “King Felix,” and they seem to appear less and less. Part of the function of Servais’ comments about Hernandez is that he’s always asked about him in his pregame and postgame media sessions. He certainly doesn’t offer up the criticism unsolicited. Realistically, given who Hernandez is and what he’s done during his time in Seattle, he’s a subject that can’t seem to be discussed enough whether he’s pitching well or struggling. There has been criticism of Ryon Healy and Kyle Seager from Servais, but it really doesn’t resonate quite the way that his comments about Hernandez have this season. Thoughts about making Felix a reliever? At this point, the Mariners are willing to try anything to find value in Hernandez. Given how much he’s owed for the rest of this season and next season (approximately $30 million), they want to try and salvage some level of contribution. I do think he’ll probably make his next scheduled start in Texas. Really, his future in the rotation seems to be on a start-to-start basis. It’s a familiar situation for pitchers on the fringes of the big leagues, but totally new for Hernandez. Since he was called up from Tacoma in 2005, he’s never felt such anxiety about his place on the team or the rotation. It was a given. A conversion to the bullpen isn’t exactly simple. Sure, his stuff might tick up a little bit in one-inning bursts. But he’s never done it before, meaning he has no routine to get ready quickly in a game, while his arm and body also haven’t been prepared for the rigors of throwing multiple times in a few days. He’s never been asked to pitch on back-to-back days or even twice in three days in his professional career. The easiest transition would be to a long reliever at first and then modifying his usage from there if you wanted to make him more of a middle reliever. Usually you use an entire spring training to make this sort of conversion. And can you really carry him on the 25-man roster to do so? Shifting to the bullpen won’t fix his command issues. And it seems unlikely to boost his stuff to the point where it can override his inability to consistently command his pitches. If the Mariners did decide to do that, it would be easiest when the rosters expand in September. Can we get your thoughts on Gamel being sent down? Initially, I was somewhat surprised when the announcement was made. Like many people, I thought that Guillermo Heredia would be sent to Class AAA Tacoma instead. The Mariners acquired Cameron Maybin because Heredia had been hitting .180 with a .230 on-base percentage since June 1 to the day of the trade. Heredia isn’t an everyday player at the MLB level. The Mariners knew it coming into the season, but the 80-game suspension of Robinson Cano forced them to use Heredia on a near everyday basis. He was overexposed, particularly to right-handed pitching. Sometimes more at-bats aren’t a good thing for a player. Given the Mariners offensive struggles since July 1, keeping Gamel, who is obviously a better hitter, seemed logical. But given the roster setup, they went with Heredia. Servais wanted to run a platoon with Heredia and Denard Span in left field. They wanted to limit using Span against tough left-handed starters and also control his usage in the field. Span is dealing with some foot issues, and at age 34, the Mariners believe he’s most productive when he gets a day off instead of playing seven or eight games in a row. Carrying eight relievers meant that having Span and Gamel on the roster at the same time would be redundant. Even with his struggles in July, the Mariners aren’t going to start sitting Mitch Haniger in right field. They believe Heredia’s defense will also provide value late in games. He is a better defender than Gamel, who was hitting .256 with a .645 on-base plus slugging percentage since July 1. You’ll definitely see Gamel in September, but you may see him sooner if the Mariners face a bunch of right-handed starters for a stretch and they are still continuing to struggle offensively. Given the structure of the roster and the addition of Cameron Maybin, it was difficult to see how much playing time that Gamel would get to truly be a factor for Seattle’s slumping offense. Here a question: Did Mariners fans really think we didn’t need Robinson Cano? Well, to be fair, not all Mariners fans thought that the team didn’t need Cano. But there is a vocal portion that expressed that sentiment along with a few local radio hosts and a former Mariners’ second baseman, who is now on MLB Network. Cano has been a polarizing player since he signed a $240 million contract with the Mariners. There are fans that complain that he doesn’t sprint to first base on every play. There are others that don’t like the flair and nonchalant way he plays in the field. The root of some of those complaints are because of his skin color and heritage as well. But the guy played with two sports hernias for more than half of a lost 2015 season, so he has some level of my respect. The Mariners need Cano back the lineup to help their ailing offense. And I will argue with anyone who says otherwise. It’s become very obvious over the last month. He’s a career .848 OPS hitter, and no team is better without that sort of production in the lineup. Cano would help offset the recent struggles of Kyle Seager and Mitch Haniger. So let’s take a look at the Mariners’ most successful stretch this season. From May 14 (the first game after Cano broke his hand in Detroit) to July 3, the Mariners posted a 33-14 record. They were eight games up on the A’s after defeating the Angels, 4-1, on that final day. During that stretch of 47 games, here are the slash lines (average/on-base percentage/slugging percentage) of the three players you mentioned. So, yes, they’ve shown they can win without high production from those three players. Maybe success isn’t completely contingent on those three guys. Sure Seattle had some luck and won a bunch of one-run games during that span, but it’s certainly possible for the Mariners to win games with less-than-ideal production from three others. Right now, they are getting decreased production from seven of the nine lineup spots. Guys like Haniger and Segura helped offset some of that lack of production when Seattle was winning, but they aren’t doing that now. Seager has been bad for pretty much the last year now, is he ever going to get back to his career numbers? Well, he’s probably not going to get back to those numbers this season, considering the hole he’s dug himself into. The constant tinkering of Seager’s swing seems to have been counterproductive the last two season, at least in terms of results. Some of those changes have been an effort to better combat the constant shifting that defenses have employed against Seager. He’s tried to get better at driving the ball to left and left-center. But it really hasn’t yielded expected results. Even worse, that effort has taken away from his ability to pull the ball in the air to right field, where a shift can’t affect him. Ellen is easily one of the nicest and most enthusiastic Mariners fans that I’ve met over the years. Some good news, yes, there will be a Mariners FanFest this season after a hiatus in 2018 because of the new playing surface installed at Safeco Field. Sources have confirmed there is plan for a FanFest, but it will likely come at a different time than in that last weekend of January. It’s a pretty cool event for fans, specifically kids, to interact with players and be on the playing surface of Safeco Field. Because you have the hardest beat reporting job, you're required to immerse yourself into knowing everything about the M's and as much as you can about the whole league. During the season, how much of your time spent awake are you NOT Twitter/working/writing? I wouldn’t say I have the hardest or most difficult beat reporting job. They all have their challenges. I actually think NFL or college football is more difficult. There are fewer games, less access to players, no reporting from practice and a secrecy and paranoia that permeates. During the season, it’s pretty much a constant from the time you wake up until you file your last story around 11:30 p.m. Obviously there are hours throughout a day where I can sneak to the gym (though Jerry Dipoto hasn’t helped that much), grab lunch with friends or do the daily New York Times crossword, but I’m still constantly checking my phone for updates and news. It’s like being on call at all times. The best time to actually zone out and watch a TV show or listen to music or read non-baseball writing is actually when I’m on an airplane flying somewhere, provided the person in the middle seat understands that anything over the armrest is out of bounds and not their personal territory. No part of the middle seat occupant should be touching the people in the window or aisle seat. Why don’t more people understand this rule? Tim Kirkjian said his time as a beat reporter were some of the most difficult and rewarding years of his life. What aspect of your job is under appreciated and/or misunderstood by the general public? Thanks! That’s a great question, and Mr. Kurkjian is good dude and a quality baseball reporter. I love my job. Not many people get to go to work each day doing what they aspired to do in their youth. I’m very thankful for that. The two things most people don’t quite understand are: 1. not being a fan of the team you cover or really any team. 2. The pressure of writing on and making deadline while avoiding mistakes and providing readable content. I think more and more Mariners fans are starting to get that beat reporter can’t be fans of the team. It’s probably because I seem to tell/remind someone at least once a week. The need to remain impartial, unbiased and fair is something I take very seriously. You can’t be emotionally attached to a team, players or the outcome. It would skew everything you do. I’m a fan of the game of baseball and good stories. As for deadline, it’s why I loathe extra innings and why Fernando Rodney almost gave me an ulcer. No matter how much you mentally prepare yourself or try to write during the game, inevitably there is that panic and dread of not getting it to the office in time and mistakes that you made. I doubt it will ever get any easier. Your name is going next to that story. It’s your work. The last thing you want is to make a careless mistake that somehow cheapens everything you’ve done for that story. what’s the best thing a young aspiring sports journalist can do outside of the class to improve? Young Jadon, who submitted this question, once tossed a no-hitter for Curtis High School at Cheney Stadium. But if I was playing in that game, I’d have sent his 84-mph heater over the wall in left-center — with a metal bat, of course. It’s not about you. It’s about the information you’re providing. The best advice I can offer is something that was given to me at the University of Montana — read. Seems simple, but it’s more than that. Read with pen. Underline sentences and words. Circle paragraphs. Take notes on the side. Write down what you like and don’t like. I still do that. And don’t just read sports or things you like. Read stories that might make you feel uncomfortable and read about things that might not interest you on most days. Also, pick a few writers and reporters that you like or respect and read everything they’re doing now and in the past to find out what you like about them. I did this with Gary Smith of Sports Illustrated in college. I will promote the brevity and nuance of Larry Stone’s writing, the dogged, relentless energy of Bob Condotta and the knowledge and working of a beat like Adam Jude. I also still study and read plenty of writers in baseball for more than just the content. I try to read every one of Andy McCullough’s game stories for the Los Angeles Times. There isn’t a better baseball writer at crafting something that isn’t just about the game, but about the team, on deadline. I read everything from Jeff Passan and Tim Brown at Yahoo, Tyler Kepner at the NY Times and Thomas Boswell, Barry Svrluga and my buddy, Jerry Brewer, at the Washington Post. I could keep going. The beauty of the internet is that you can access all of this fantastic reporting and writing by really talented people all over the country … and learn from it. Give me a player comp for each of the Scott brothers in the NBA if they never get a heart condition/thrown through a window. This might be the greatest question I’ve ever received for a mailbag. Ben is referring to the teenage melodrama “One Tree Hill” where half brothers, Nathan and Lucas Scott, were born to different mothers and grew up strangers in the same town only to play on the same high school basketball team — the Tree Hill Ravens. Lucas Scott is a 6-5 shooter with NBA level range and a solid mid-range game. He’s limited defensively, not a great ball handler and only a decent finisher at the rim. He lacks strength to rebound and guard a No. 3. He’s basically a shorter version of Kyle Korver or Joe Ingles or a less mobile version of Robert Covington. Nathan Scott is a 6-3 combo guard. While probably not tall enough or possessing enough shooting range to be a full-time shooting guard, he does have the overall strength and ability to get to the rim to be effective. He’s probably better suited as a point guard to take advantage of his physical style of play, his ability to finish at the rim and his passing ability. His overall strength and quickness will allow him to guard either point guards or shooting guards. He’s a less explosive version of Donovan Mitchell or maybe right-handed version of Goran Dragic. As a Montanan, what do you think of the TV series Yellowstone? A fine journalist from the east side of the state checks in with a question. The portrayal of Montana is far from perfect. Though the mocking of Bozeman becoming filled with folks from California and other out-of-staters was amusing and true on some level. I did like the usage of Texas’ country acts Ryan Bingham and Whiskey Myers in the show. I’m sucker for westerns. And I’m an even big homer for my home state. So, of course, I’m going to watch it. Unfortunately, the entire series isn’t filmed in Montana. The filming for the home of the Dutton family is in Darby in the Bitterroot Valley. But several scenes are also filmed in Utah, which is understandable if not ideal. I’m about five episodes in and I enjoy it. It’s a little unrealistic and over-the-top in some ways. But it’s entertainment level provided brings me back. Who's your favorite Red Dirt artist? My introduction to this genre of country music came about six years ago from by buddy, Bryan. He took me to see Cody Canada and the Departed at the Tractor Tavern. But my two favorite artists are The Randy Rogers Band and Turnpike Troubadours. Sad, regretful country songs are the best and Rogers has plenty of them. If you are looking for a song about a personal heartbreak, he has one for you. Thankfully, the band comes to Seattle multiple times a year so I’ve seen perform live often, often at the Showbox. Speaking of that fine musical venue, the city needs to do everything possible to keep that building from being torn down. It’s a part of the city’s musical culture that needs to preserved. Turnpike Troubadours are a close second behind RRB. Their songs have smart lyrics on a variety of topics, some you wouldn’t associate with country music. They’ve performed once in Seattle back at the Tractor several years ago and they’ve opened for Miranda Lambert at the Tacoma Dome. But their growing popularity and crowd sizes seems to have made a return for their own show difficult. A question from a quality journalist, who I read almost every day during my time spent in the fine city of Missoula, Montana. Given the fact that I’m only able to go fly-fishing about once or twice a year, usually in the fall, I’ve been reduced to nymphing. It’s probably better that way since my casting has minimal touch or accuracy — like a Blake Bortles’ pass. But there is nothing quite like properly casting a dry fly, seeing it present on the water and watching a rainbow rise to take it. The anticipation followed by exhilaration make your entire body feel alive.